In digital electronics, because of the ever growing popularity and usage of multimedia systemsand internet Image Compression has become one of the most important disciplines which combined with the high requirements of the bandwidth and storage space. There are various compression techniques to decrease the efficiency and space storage transfer the image over the network for access to electronic image records. Image Compression is the method of reducing the volume of data for representing an image. For different compression techniques, some form of entropy coding is used in lossless image compression while in lossycompression transform coding and predictive coding is used. Wavelets are irregular shaped signals which are local in time and scale has an average value of zero and is basically a waveform of limited duration. Information of image is divided into detailed and approximation sub-signals by using wavelet analysis. WT is an evolving technology which offers higher degree of data compression compared to other standard transformation methods. With the inherent features of wavelet transform, better compression performance improving the signal to noise ratio. For this purpose there are several wavelet based algorithms have been implemented. For constructing bi-orthogonal wavelets, lifting scheme (LS) is the proposed method used in image compression. Peak Signal to Noise ratio used to be a measure of image quality .Usually measure closeness with MSE (Mean Squared Error) and PSNR (Peak Signal to Noise Ratio) want low MSE and high PSNR. Data redundancy is the central issue in digital image compression. Many algorithms have been developed to find sparse representation over redundant transform. Wavelet Transform & Wavelet transform based compression algorithm gives better quality of image at receiving end but it takes more time. Another problem with conventional algorithm is that it is designed for lossy image compression. 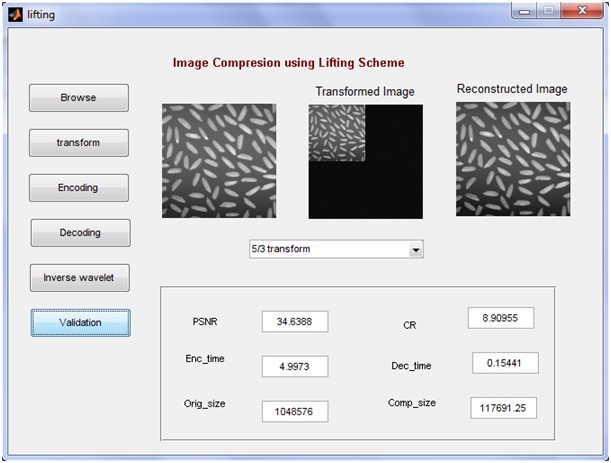 Reducing the computation time by implementation of lifting scheme in forward and backward operations of image compression and Performance analysis of compressing and reconstructing lossless images using integer wavelet transform (IWT) along with lifting scheme. IWT can be computed starting from any real valued wavelet filter by means of the lifting scheme. This algorithm is able to reduce the number of bits for the sample storage. 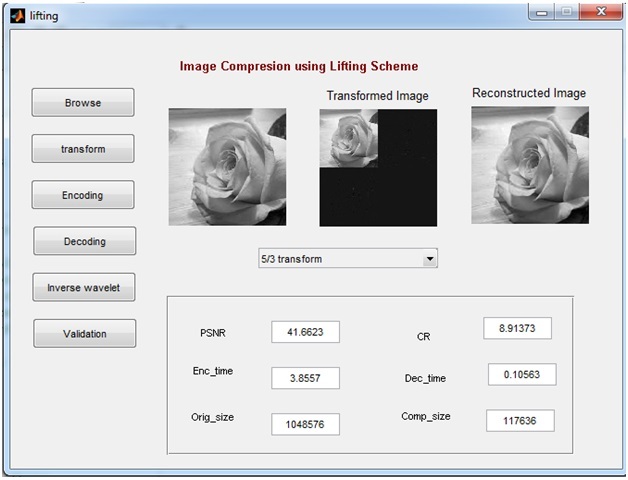 This transform is reversible which means that it can be used for both lossless and lossy image compression. Mostly Wavelet Transformgenerates float-point coefficients that are not very suitable for Lossless Image Compression. 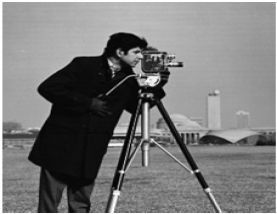 IWT have been introduced since it is more practical for Lossless Image Coding. In the present work an algorithm has been developed to compress and reconstruct gray scale image in image compression system. The proposed method combines Lifting scheme along with Integer wavelet transform to provide less computational complexities and superior PSNR values and Compression Ratios (CR). In this algorithm, computation of the scaling coefficients requires adding two samples values and dividing by two. Calculation of the wavelet coefficients requires subtracting two samples values. The developed lossless image compression method for continuous and discrete time cases, an integer wavelet using the lifting scheme which reduces the computation time. Integer wavelet Transform (IWT) can be built by iterating the single wavelet decomposition step on both the low-pass and high-pass branches, with rounding off in order to achieve the integer transforms. Therefore, IWT with lifting scheme provides good compression ratio. For constructing bi-orthogonal wavelets, lifting scheme is the best method. Haar wavelet, Daubechie wavelet, Demeyer wavelet, Coiflet wavelet and Symlet wavelets are considered under Hand designed wavelet category. The lifting scheme is a simple method for designing customized bi-orthogonal wavelets and offers several advantages. • Allows a faster implementation of the wavelet transform. • Saves storage by providing an in- place calculation of the wavelet transform. • Simplifies determining the inverse wavelet transform. • Provides a natural way to introduce and think about wavelets. Since the lifting scheme makes optimal use of similarities between the low-pass and high-pass filter, the computational complexity can be reduced by a factor of two compared with traditional fast wavelet transform algorithm and speedup mechanism is also possible by using the lifting scheme.Here, the lifting scheme improves the efficiency of the algorithm and also improve results by correctly handling image boundaries without the introduction of artifacts. The proposed method speeds up the computation time needed for encoding and decoding the data set with comparable performance in compression ratio and peak signal to noise ratio.Lossless image compression is an important topic with a variety of applications, such as medical imaging and seismic data analysis, as the processing and transmission of very large data sets is required, yet errorless image compression must be maintained.Proposed algorithm is lifting based scheme CDF 5/3 (The high pass filter has five taps and the low pass filter has three taps) filter give lossless mode of information.The corresponding wavelet transform with certain modifications are calculated even with only integer addition and shift operations which makes the computation even faster in lossless image compression. 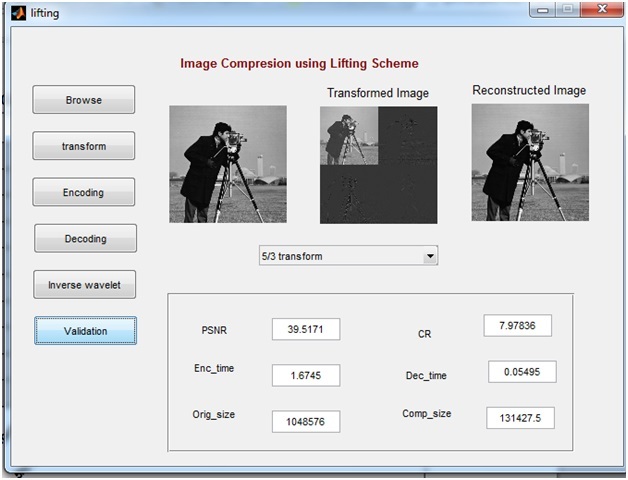 Application : Image compression for Data transfer. This approach is suitable for the applications in which the speed is critical factories software based video-conferencing and real time image compression systems. The wavelet transform has been shown to provide this task with excellent results.